Natalie Imbruglia is an example of however hard you try, sometimes you can never escape your past. For some she'll always be Beth from Neighbours, others the girl who sang "Torn" all those years ago, and despite her desire for credibility those two elements will always be with her. If anything it's this over earnest need to be taken seriously that has affected her career to the point where rather than create classic songs it levels out to a bland coffee table malaise. Alongside the classic singles "Torn" and recent hit "Shiver", the one song which really stands out is a track which could have quite easily have come off Kylie's "Impossible Princess" album. It's the one moment of unpredictability, her Darren Hayes moment if you will, where she ditches the format of predictable mid-tempo ballads and sends her voice soaring over techno beats and processed guitars. 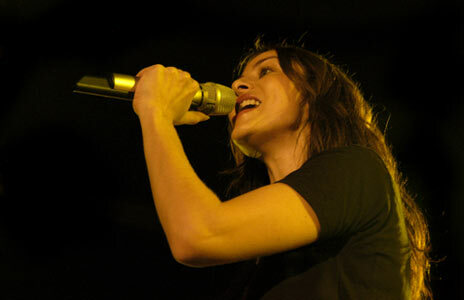 Imbruglia is an amazingly versatile vocalist being able to emote her range from a tiny whisper to a powerful rock vocal, which is ultimately much more satisfying that her musical hero Alanis Morrissette. 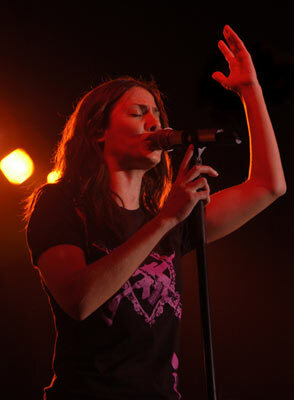 With a little more grit Imbruglia could deliver songs that compete with Fiona Apple and Liz Phair. At the moment Natalie Imbruglia is an artist who delivers time and time again playing crowd pleasing tracks for people of a certain age, but she really needs to break out of her comfort zone to really be taken seriously. She may lose some of her fans in the process as you get the feeling they find Keane too experimental with the non-guitar action going on, but in the process she could find that credibility she so rightly deserves. Take the leap Natalie!! Engaging and high spirited guitar pop is what the jovial Robert Post does and does well. He used tonight as the perfect forum to advertise his flowery musical style. ‘Godmother’ displayed fully his Ray Lamontagne and underpinning of Liam O'Maonlaí singing style. Spicy nostalgia was added with a carefully slotted portion of ‘Lucy In The Sky With Diamonds’ into one of the offerings towards the end. Robert provided warmth, both between songs and during them, to ensure that everyone was ready for the appearance of the main lady. 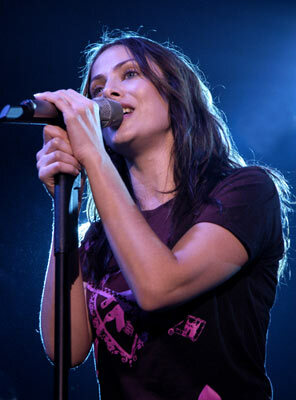 The band entered first and slowly started the riff to ‘Wishing I Was There’ from her 1998 album ‘Left Of The Middle’, before Natalie Imbruglia sprung onto the stage and poured her heart and soul into the troubled and racing indie/pop pearl; non verbally imploring the crowd to do so also. Effervescently glowing all the way through, Natalie seemed to be relishing the fact that three solid albums have helped her to carve a niche as a serious artist. 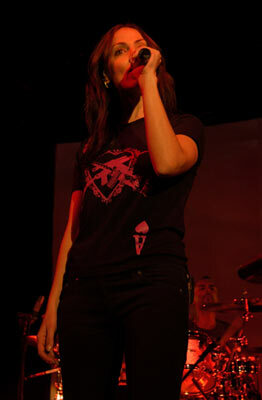 ‘Satisfied’, did exactly that to the appetite of the crowd for the soulful and slightly gritty pop. Natalie played a pleasing tribute to an obvious influence; Neil Finn by way of a cover of the Crowded House cruncher ‘Pineapple Head’. A low key acoustic accompaniment to ‘Starting Today’ allowed the antipodean’s vocals to soar out with extra bite. This number from the thoughtful and slower; ‘White Lillies Island’ album highlighted the range of songs in the back catalogue. Energetic versions of ‘Torn’ and ‘Impressed’ made for a lively hands in the air finale, ensuring that three quarters full venue emptied with a spring in their step.